Popular Ocean City restaurant and brewery, Ocean City Brewing Company, will be making its Baltimore debut at The Boulevard at Box Hill project in Abingdon, Harford County, Maryland this fall. Ocean City Brewing Company will be taking the place of Joe’s Crab Shack that just announced their upcoming closing on September 9, 2015. MacKenzie Retail’s Executive Vice President/Principal Tom Fidler and Associate Laura Williams represent the owner of Boulevard at Box Hill, Ward Properties. Ocean City Brewing Company’s move to Baltimore signifies more than the opening of another great dining option; it is a role reversal of the trend where a Baltimore company heads to Ocean City or neighboring beach towns. In the past five years, we have witnessed Baltimore-based Ryleigh’s Oyster, Buddy’s Crabs, Ropewalk Tavern, Dead Freddie’s, and Abbey Burger Bistro all make their beach debut. The Ocean City market continues to be a vacation destination for the residents of Baltimore and surrounding counties. With successful brands and dining experiences here locally, these restaurants have looked to Ocean City for the opportunity to expand that same customer loyalty, and mix in the impressive tourism Ocean City enjoys during the summer months. With the ever expanding summer season and Ocean City becoming a more year-round community, their customer base can now grow exponentially. “The departure of Joe’s Crab Shack is unfortunate; however, any opportunity to revamp a freestanding restaurant as part of a larger mixed-use project, and to re-tool a menu to better serve the community, is always exciting,” said Jim Martin of Ward Properties. Ocean City Brewing Company is a full-service craft brewery with a family restaurant, craft beer pub, and gift shop. Owner Joshua Shores, a true Ocean City native has split his time living between Bel Air, MD and the beach, and longed to bring something back to his hometown. His enjoyment of craft beer and admiration of the camaraderie among breweries, he decided this was what he wanted to do. Ocean City Brewing Company opened in June 2014 and has experienced tremendous growth and has established a solid following. Their motto – “Good beer, Good food, and Good people.” They are a full production brewery & restaurant serving numerous homemade American brewpub specialties and handcrafted beer. The growing business also recently launched a Beach Vodka line, handmade in their small distillery, and a house red and white wine which will debut in 2016. Ocean City Brewing Company’s Box Hill location will provide the opportunity for the establishment to grow its restaurant portion of the business. The 8,500 square foot layout will be a “tap house” that will showcase more than 150 beers, offers a family-style restaurant section with a family friendly outdoor playground, craft beer pub area, and have live entertainment on weekends. 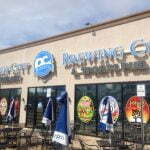 For more information on Ocean City Brewing Company, please www.ocbrewingcompany.com. For leasing inquiries contact Tom Fidler at tfidler@mackenziecommercial.com or 410-494-4860, or Laura Williams at lwilliams@mackenziecommercial.com or 410-494-4864 of MacKenzie Commercial Real Estate Services.